2013-02-06 - Lebanon, KY - Photo by the Feedman, Kenny Browning. A George F. Barber design, The Keyhole House, located in Lebanon, KY: I have driven past this house thousands and thousands of times and never really noticed it. A few days back I received a flickrmail from a guy in Boston wanting to know if I would take a few photos of a house in town . He was researching the architect of this house and wanted photos of it, and, since it was a bit out of his way to take the photos himself ( a solid day and a half drive from Boston, MA ) . I'm always willing to help a fellow flickrite out! This has caused me to look at the house from a new perspective. . . amazing how a person can overlook amazing houses when you see them on a daily basis. With that being said "Black.Doll," this one is for you. A contact that I'm sure will appreciate a George F. Barber house. I have an appointment with the owner of this house to take photos of the inside . It should be a treat to get to see the inside. 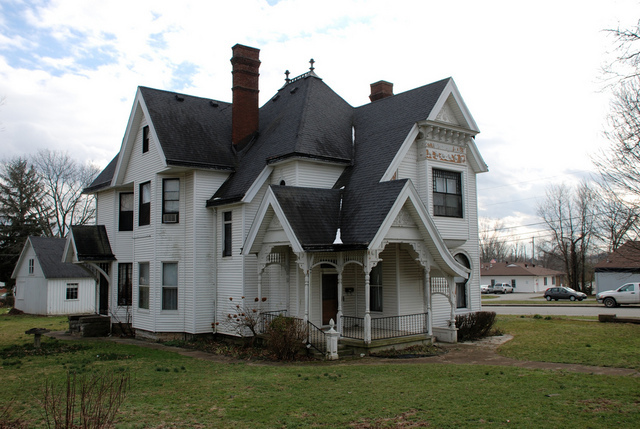 The house was built in 1898 and only two families have owned it. - Kenny BrowningSeen in the ColumbiaMagazine group on Flickr.